The Sweepstakes is open to legal residents of the 48 contiguous United States, including the District of Columbia, who are age 18 or older and the age of majority in their state of residence (19 in Alabama and Nebraska; 21 in Mississippi) at the time of entry. Void in Alaska, Hawaii, Puerto Rico, Guam, the U.S. Virgin Islands, outside the U.S., and wherever else prohibited by law. Employees of B.A.S.S., LLC (the "Sponsor"), US Sweepstakes & Fulfillment Company (the “Sweepstakes Administrator”) and their respective subsidiaries, affiliates, advertising and promotion agencies, and the immediate family members (spouses, parents, children, and siblings and their spouses) of, and/or those living in the same household of each, are not eligible to enter. Sweepstakes is subject to all applicable federal, state and local laws and regulations. There are two (2) ways to enter. Method #1: Online Entry. During the Sweepstakes Period, visit www.facebook.com/bass and click on the sweepstakes app link, or visit www.bassmaster.com/fishwithhunter follow all entry instructions to complete the entry form and submit to receive one (1) entry into the Sweepstakes (the “Online Entry”). Limit: There is a limit of one (1) Online Entry per person per day. This Promotion is not in any manner sponsored, endorsed, administered by or associated with Facebook. Method #2: Event Entry. During the Sweepstakes Period, attend a participating Bassmaster Tournament Event (each, an “Event”), visit the Bassmaster booth during operating hours, locate the Official Sweepstakes Entry Forms, follow all instructions to complete one (1) Official Sweepstakes Entry Form and place it in the entry box provided to receive one (1) entry into the Sweepstakes (the “Event Entry”). Limit: There is a limit of one (1) Event Entry per person per Event. PRIZE/APPROXIMATE RETAIL VALUE (“ARV”)/ODDS: There is one (1) Grand Prize available to be won. 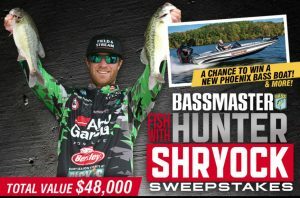 One (1) Grand Prize winner will receive a prize package consisting of: One (1) trip package for one (1) person, the Grand Prize winner, to a to-be-determined U.S. location to fish with Hunter Shryock. Trip dates and location to be determined by Sponsor, based upon Hunter Shryock’s availability. Trip package includes: Round-trip, coach-class airfare for winner to a location to be determined by the Sponsor from a major airport nearest the winner’s residence within the 48 contiguous United States*; Four (4) days / three (3) nights hotel accommodations based on single-occupancy at a hotel of Sponsor’s choice; Rental car for the duration of the trip; and $500 spending money; One (1) Phoenix Boats 618 Pro XP bass boat with Mercury 150L Pro XS; One (1) Lowrance HDS LIVE 7 with Active Imaging 3-in-1; One (1) Rigid Industries Boat Deck Light Kit and one (1) Buckup Kit; One (1) $500 Power-Pole Gift Certificate and one (1) Power-Pole gear package; One (1) Assorted Tackle package, including Abu Garcia, Berkley and Spiderwire tackle; One (1) $500 Field & Stream Gift Card; ONe (1) Keelshield Prize Package with assorted gear; and One (1) Bob's Machine Trolling Prize Package with motor upgrade package and apparel. The ARV of Grand Prize: $48,000.